As someone that plays keyboards I’ve been mostly resigned to the fact that I can’t put guitars in any of my tracks, but after some playing with guitar samples available at the Flame Studios website, I’m cautiously optimistic. Flame Studios has high-quality recordings of various guitars (like the Fender Telecaster and Gibson Les Paul) in GigaStudio format, and when used appropriately, they sound great. Their website has been down for most of the last few years, but I’m hoping that it’s now back for good. Most of the recordings are straight from the guitar’s line-out, which I think is ideal: if you want a clean sound, you can use it as-is, or you can run it through your choice of amp simulation to get a more typical guitar sound (something I’ve always been curious about but never had a chance to try). 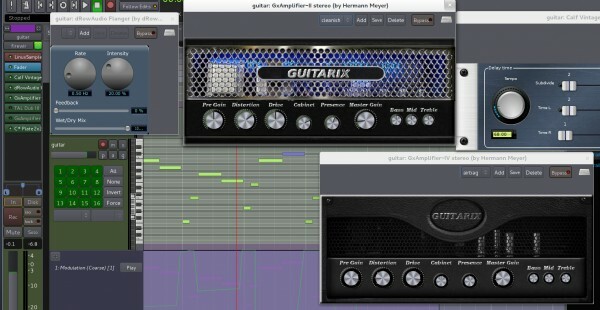 I was testing the samples using the Linuxsampler LV2 plugin in an Ardour 3 MIDI track, so I decided to try Guitarix, which as of version 0.25 includes some pre-built combinations of tube amp, tonestack, and cabinet as LV2 plugins. So far, I’ve been quite impressed with Guitarix. I haven’t had much experience with amp simulations, but even so, with appropriate twiddling of knobs I’ve been able to get some crunchy distorted sounds, and some cleaner sounds that add a lot of character without over-the-top distortion. There are other options — Rakarrack has some amp/cabinet simulation features (though it focuses more on effects), and the C* Audio Plugin Suite provides amp/cabinet simulations as LADSPA plugins — but the simplicity and quality of the Guitarix LV2 plugins won me over. The sound itself is just one piece of the puzzle — the other is to play things in a believable way. Keyboards can do a lot of things that guitars can’t, so you have to limit yourself playing parts that at least sound like they would be possible on a guitar. Arpeggios with wide gaps between notes are an easy cheat, but if you want to play chords, a list of guitar chords mapped out on the keyboard, like this one, is very helpful. Of course, the reverse is true, too — guitars can do a lot of things that keyboards can’t. Many of the Flame Studios guitars include extra samples of finger slides and other guitar sounds beyond just the notes, which you can sprinkle in to a part to add some realism. Subtle MIDI pitch bends can help add some expression, too, though they really stand out if they’re done poorly. You’re not going to be able to capture the subtlety and nuance of a real guitar, but with a bit of care, I think you can definitely create basic guitar parts that sound convincing enough to work in a mix. On to the sketch! Using the Telecaster line-in sample set recorded from the bridge pick-up, I came up with a simple little arpeggio-ish riff thing, and then tried running it through various Guitarix settings. In the sketch you hear three versions of this riff: the first is completely clean, the second uses the Guitarix GxAmplifier-IV plugin with fairly heavy drive settings and a CAPS Plate reverb, and the third uses the GxAmplifier-II plugin with much cleaner settings, along with a Calf Vintage Delay, dRowAudio Flanger, and the CAPS Plate reverb again. Before it gets too far in to January, I wanted to take a quick look back at last year. I had been planning to record an EP, along the lines of the track Texel that I released in late 2011, but instead, I took part in the RPM Challenge and recorded a full album. From RPM I hoped to get a rough collection of tracks with a few good ideas I could re-use on the EP; instead, I got an album that, while unpolished, felt complete, and I didn’t like the idea of cannibalising it for another project. I could’ve recorded more new work later in the year, but nothing really came to me; perhaps it’s a cliché, but I didn’t feel like I had much to say. I did have a great time working on a couple of game projects, though — working to a brief on Candy Grapple turned out to be a lot of fun, and I’m hoping I get more opportunities like that in the future. While I didn’t record much this year, I think I spent more time at the keyboard than I have since high school. I haven’t been happy with my playing, so I grabbed some books and went back to basics, re-learning how to sight read and working on my technique. I still feel like a beginner when I sit down to play something for the first time, but I feel a little less that way each time I do. This year? I have another game project to work on — the game itself is pretty far along already, so I’m pretty confident that this one will see the light of day, so that’s the focus for now, along with piano practice. Beyond that, it’s anyone’s guess! I got two great new studio toys for Xmas: Loomer Aspect and Sequent. This sketch is a quick demo I made while getting a bit of a feel for them both. Loomer’s plugins are all available as native Linux VSTs (as well as Windows and OS X), so they work well within Ardour 3. Aspect is an analog-style soft synth with hugely flexible modulation options — it’s very easy to route its modulation sources, including three envelopes and three LFOs, to a wide variety of parameters, which gives you a lot of creative power. My favourite feature so far is its unison control, which lets you use up to five voices for each note. The coolest part of this is that the unison depth is a modulation source, so you can, say, route the unison depth to the pan control to spread those voices out across the sound stage, or route it to oscillator pitch to create massive detuned sounds. It’s not as flexible as my Waldorf Blofeld, but Aspect is far more flexible than TAL NoiseMaker while remaining quite approachable to program. My RPM album really taught me the benefit of having synth plugins to use; now I’ll be able to do a lot more in-the-box, saving time and effort. Sequent is an entirely different beast, and it’s not the easiest thing to explain — the simplest description is that it’s a multi-effects module that lets you sequence the parameters for each effect. It can create rhythmic delays, pans, and distortions, but perhaps its most versatile effect is the looper, which lets you slice, reverse, and loop the incoming audio to produce all manner of glitchy, stuttery effects. You can sequence everything precisely, or use any degree of randomness that you like, and it’s even MIDI-controllable, which opens possibilities for live use. Now, for the sketch. It’s based on an Aspect pad that uses a clock-synced LFO routed to the filter cutoff, giving it a rhythmic rise and fall (I tried this using MIDI clock sync on the Blofeld on an RPM track, but it didn’t quite work). On top of that, I’ve added some simple percussion, again using Aspect — the kick is one of the included presets, but the hat and snareish-thing are my own patches. While the kick keeps time, the hat and snare are sent through Sequent to glitch them up. I used a Sequent preset for this, which operates mostly randomly — if I was using it for real I think I’d want to either remove the randomness, or record a bunch of random loops to audio and hand-pick the best ones. As you’d expect, I recorded this in Ardour 3 — it’s shaping up very nicely right now, so I’m hoping we won’t have much longer to wait before the final 3.0 release. There was a solar eclipse in Australia today; in a few lucky places, such as Cairns in far-north Queensland, it was a total eclipse, but down here in Melbourne it was just a partial eclipse. I wasn’t sure if the sun would be up high enough to get much of a view of it from my backyard, so at first I just caught a quick glimpse of it using my eclipse glasses. As it turned out, I had a great view, so I cobbled together the same observing setup I used for the transit of Venus earlier this year: binoculars strapped to a tripod, projecting the sun’s image on to a sheet of paper. 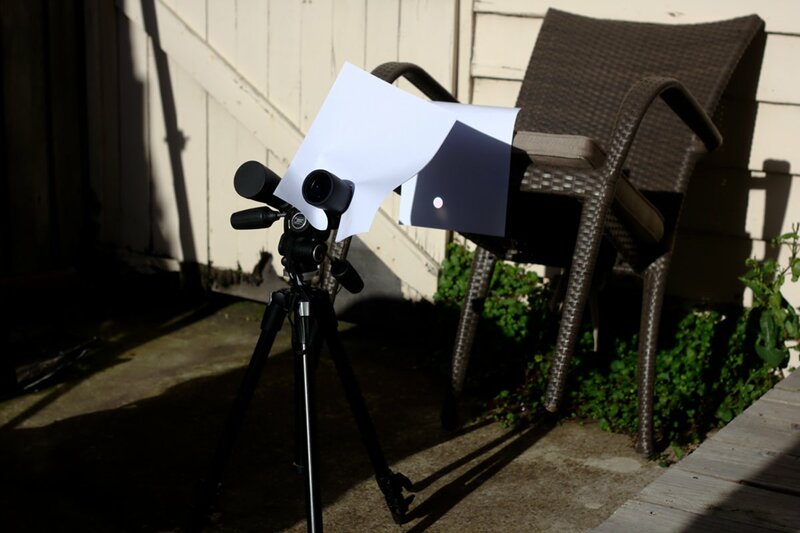 This setup produced some sharper pictures than I managed with the transit of Venus — I think sitting the paper further away from the binoculars helped. I’ve processed these shots a little, converting them to grayscale using just the green channel (it was sharper than the red or blue channels, and much sharper alone than combining all three channels) and boosting the contrast to bring out some surface detail. 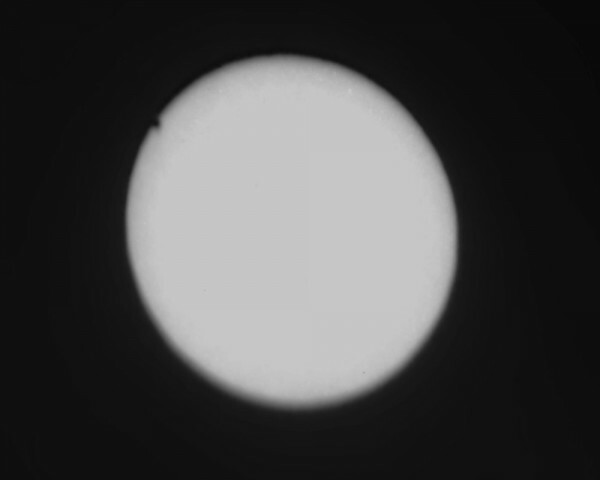 The “grain” in the images is just from the paper, but those dark spots on the images are definitely sunspots. Seeing this has given me an even greater desire to see a total solar eclipse — I’m sure I’ll get the opportunity eventually! They do happen fairly often, but you need to be in the right place in the right time, so unless one happens to occur right here I might have to plan a trip to see one. Things have been quiet here of late, but I’ve actually been quite busy! 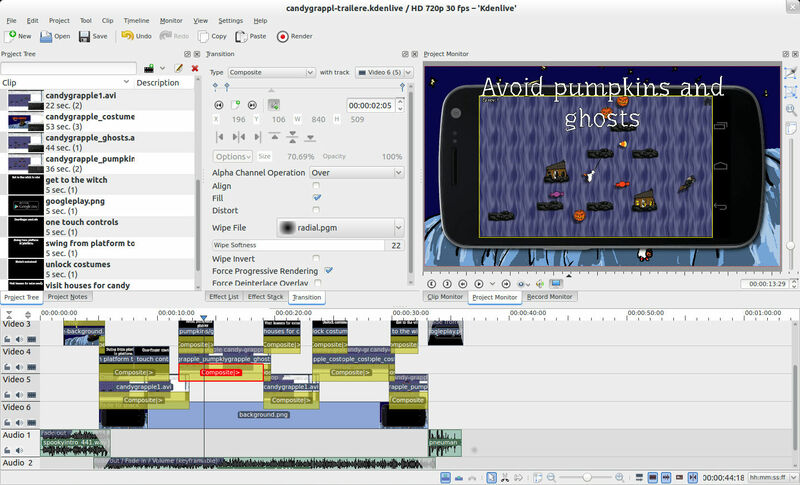 I’ve just finished the sound design for Candy Grapple, the latest game from my good friend Switchbreak. It’s based on one of his Ludum Dare games, Waterfall Rescue, but it’s been fleshed out in to a full game, with much more complete gameplay, many more levels, and a spooky Halloween theme. It’s out now for Android, and there’s an iOS version on the way, too. Switchbreak asked me to make some suitably spooky-cheesy music for it, and I happily agreed; once I started working on that, I realised he’d also need sound effects, so I offered to create those, too. Read on for details! The bulk of my time went in to the in-game background music. Halloween music was new territory for me, but my mind went straight to The Simpsons Halloween specials, and the harpsichord and theremin closing credits. I thought about other “spooky” instruments and came up with the organ, and while it’s not spooky as such, the tuba seemed suitably ridiculous for the kooky carnival sound I was after. I didn’t want to over-use the theremin, so I stuck with organ for the melody for the most part, and saved the theremin for the bridge, where the harpsichord and tuba drop away in favour of some organ triplets and piano bass notes. A standard drum kit didn’t seem like a good fit (with that bouncy tuba part, it was in danger of becoming a polka), so I stuck with more random, wacky bits of percussion, like castanets and a vibraslap. I did use some cymbal rolls and crashes in the bridge, though. 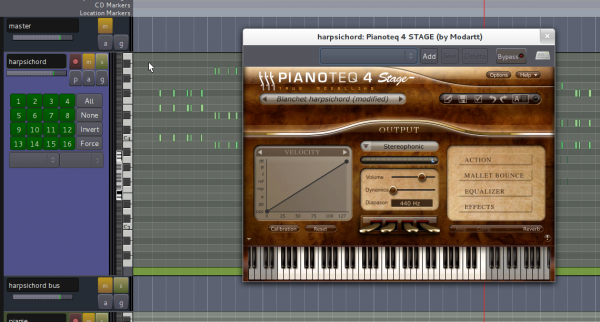 Now, for the instruments: I used Pianoteq for the harpsichord and piano, as you’d probably expect; the percussion sounds were from the Sonatina Symphonic Orchestra, played using the LinuxSampler plugin; and the theremin was a simple patch on the Blofeld. The tuba and organ, surprisingly, come from the Fluid GM soundfont. I’m not usually a fan of instruments from GM sets, and I did try a few alternatives, but the Fluid sounds were very well-behaved and sat well in the mix, so I didn’t let myself get hung up on where they came from. Faking the theremin was fairly straightforward — it’s just a single sine-wave oscillator, but with some portamento to slur the pitch changes and an LFO routed to the oscillator pitch to add vibrato, both of which make that sine wave sound suitably theremin-ish. I used TAL NoiseMaker at first, but switched to the Blofeld so I could use the modwheel to alter the amount of vibrato (the Blofeld’s modulation matrix makes this sort of thing easy); in hindsight, it would’ve been just as easy to stick with NoiseMaker and alter the vibrato by automating the LFO depth. The mix came together fairly quickly. There’s a bunch of reverb (I had trouble getting the IR plugin working, so I used TAP Reverberator instead), a little EQ on the tuba and organ to brighten them a bit, and some compression on the piano to add sustain, but that’s about it as far as effects go. The only tricky part was making sure the transition in to the bridge wasn’t too abrupt, but all that really required was some careful balancing of levels. It was, of course, all recorded and mixed in Ardour 3 — it has an annoying MIDI monitoring bug right now, but I’m hoping that’ll be fixed soon. I wanted to add some music to the title screen, too, so I come up with a little organ fanfare-ish thing and recorded it in to Ardour. The organ is the setBfree plugin, a Hammond B3 emulation based on an old app called Beatrix. Beatrix had taken on near-legendary status in Linux audio circles, partly due to its great sound, and partly due to being near-impossible to run. It lacked JACK support and had various other issues, and its strict licencing forbid forking it or distributing patched versions. Somehow, though, the setBfree devs managed to negotiate a suitable licence, and have added JACK support, LV2 plugin support, and a basic GUI. 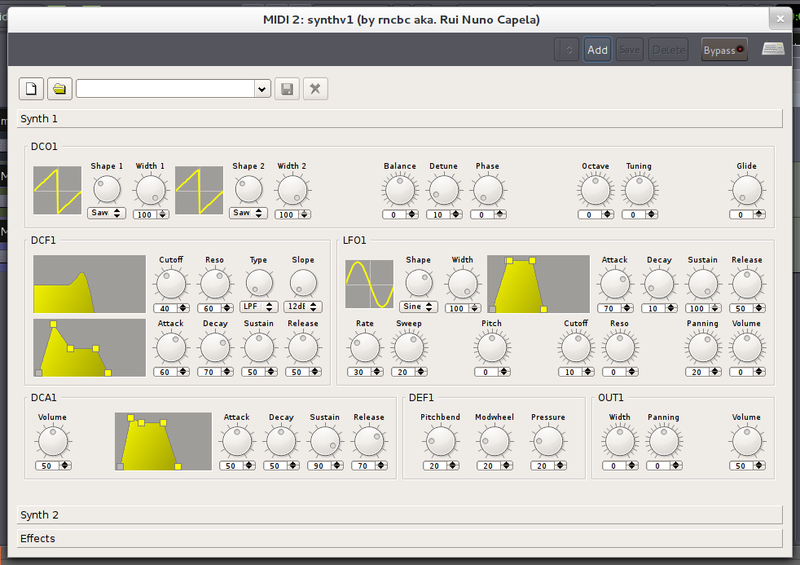 The GUI is a separate app that talks to the synth engine (whether it’s the JACK app or the LV2 plugin) via MIDI; it lets you configure the organ stops manually, or load presets. The thunder sound was my own recording — I have a habit of setting up my Zoom H1 and letting it record during thunderstorms, and that’s finally come in handy! Sound effects are hard; I’ve had a little experience with this, working on another game for Switchbreak which is still in development, but it’s all still fairly new to me. I used synths for some — Pianoteq came in handy once again here, for its tubular and church bells — but the rest were recorded sounds, mostly of me using things to hit other things. For the flapping bat wings, for instance, I slapped rubber gloves together, and idea I saw on this list of sound effects techniques. I’m pretty happy with the fact that there are two vocal samples in there, too — the ghost and the witch are both me. The witch’s cackle just took some pitch shifting and a bunch of reverb. As the game neared completion we realised it’d need a trailer, so I volunteered to make one, using Kdenlive. I used ffmpeg to record video from the Flash version of the game, then brought that in to Kdenlive, where I composited it on top of the phone image and background. It was a fairly straightforward edit, but I had some fun with it — I hadn’t played with wipes before now, for instance, so I took the opportunity to ham it up and throw some in. It was nearly two years ago that I got my first Android phone, a HTC Desire, so I figured it was time for an upgrade, so this week I picked up a shiny new Galaxy Nexus. While it’s not quite as fast as some newer phones, it’s a massive upgrade from the Desire, it’s affordable, and it should be more than fast enough to see me through the next two years. The first thing you notice is its sheer size, and the second is that amazing screen. It’s large enough that it’s a little difficult to use one-handed, but I’m definitely getting used to it — the Desire already seems tiny in comparison. It’s surprisingly light, but not so much that it feels cheap, even though it’s mostly plastic. The textured back panel feels good, but doesn’t provide the same grip that the Desire’s rubberised back does. Compared to the Desire, the performance is ridiculous. The Desire’s Achilles heel is its minimal internal storage, which leads many people (myself included) to install a custom ROM that moves internal application storage on to a special partition on the SD card; it’s a clever solution, but it can make the phone feel sluggish, because loading applications puts you at the mercy of your SD card’s performance. While I’m sure the substantially faster CPU and extra RAM help, I suspect it’s the faster internal storage that makes the Nexus feel so much faster in use. I was running a hacked ICS ROM on my Desire, so the Nexus wasn’t a software upgrade for me; it was somewhat odd, in a way that I’m sure iPhone owners must be familiar with, to find my shiny new phone running the same OS as my existing phone. ICS really is a major upgrade — beyond the extra features, it just looks and feels much more distinct and consistent than any previous release. The Nexus uses on-screen soft keys instead of hardware buttons, and the traditional menu button is not among them. In apps updated for ICS, the menu is available through a button within the application UI, while in older apps, a small menu button gets added to the soft keys; the newly-revamped Android style guide has all the details. I think it’s a good move — when I started using Android, I had to get in to the habit of hitting the menu button in every app just to see what it revealed, so making menus more discoverable is a plus. One thing I really like about the Nexus is that it has unified internal storage — there’s still sandboxed application/data storage and shared virtual SD card storage, but they’re both on the one partition, so there’s no fixed division between them. The upshot is that the Nexus doesn’t support USB mass storage, since it can no longer provide direct block-level access to the internal storage. Instead, it implements the PTP and MTP protocols for file transfer. Most photo apps (including Shotwell and iPhoto) support PTP, several music players (including Banshee and Rhythmbox) support MTP, and Nautilus supports them both, so if you just want to copy files, that’s easy to do, too. Windows also has built-in MTP support, but for general file transfer on OS X, you’ll need the Android File Transfer app. Another option is to use AirDroid, which lets you transfer files over Wi-Fi using your browser. It’s clear that Google sees USB transfers as an archaic solution when you can store your photos and music in the cloud instead. I signed up for Google Music when I was last in the US, and I’ve since uploaded my music collection to it, so it was all accessible on the Nexus as soon as I signed in to my Google account. The photos from my Desire were all there, too, thanks to Google+’s instant upload feature. The Galaxy Nexus has some obvious competitors now, such as HTC’s One X (and the smaller One S) and Samsung’s Galaxy S III; they’re both of a similar size and have newer, faster hardware. There were a few reasons for going with the Nexus — cost was a factor, as was the fixed battery on the One X (I’ve already bought a spare battery for use on our next holiday) — but my main motive was to get a stock Android device, without vendor customisations. Both HTC and Samsung insist on some pretty heavy-handed meddling with the OS, undoing a lot of the great design work that went in to ICS. It also means they’ll be less likely to get updates in a timely manner — they may all run ICS today, but Android 4.1 looks set to be revealed as soon as next week, and there’s no telling how long it could take for HTC and Samsung to release their own upgrades. I haven’t written about any astronomical stuff for a while, but today was a special day — the 2012 Transit of Venus. A transit is just like an eclipse, but with a visibly smaller object moving in front of a large one; in this case, Venus moved across the face of the Sun, as viewed from Earth. These transits are rare — the next isn’t until 2117 — so I spent the morning at a special viewing event at the Melbourne Planetarium. 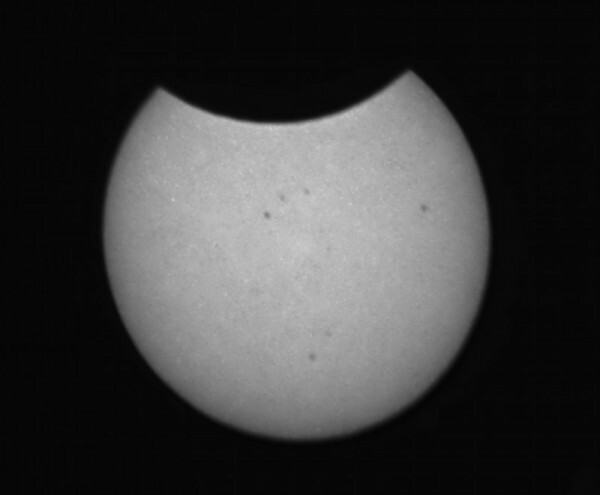 There were some clouds around early in the morning, but by the start of the transit at about 8:16, all was clear. The Planetarium had a great setup: a couple of small solar telescopes, which gave a great view of the whole Sun with some surface detail, and a couple of larger telescopes with heavy solar filters on them, which had more zoomed-in views. There was also a telescope set up to project the Sun’s light on to a projection screen. After the actual viewing, there was a planetarium show explaining the mechanics of the transit, and discussing its historical importance; there’s some more detail on Wikipedia, but suffice it to say that observations of the transit were a big deal, and the 1769 transit in particular saw expeditions to all corners of the globe to get measurements. 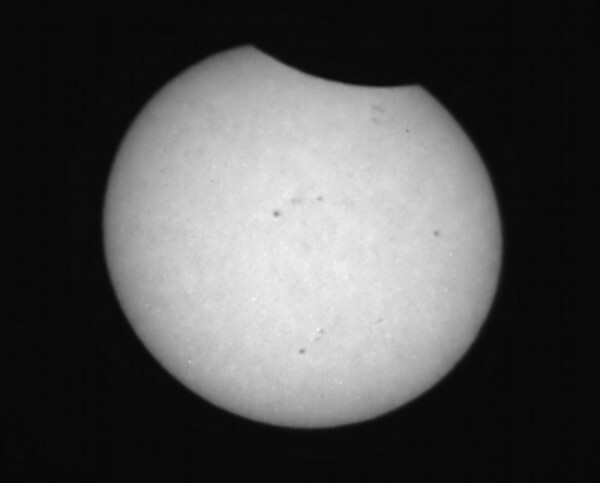 By the time the show was done, clouds had rolled over, and it looked like they were there to stay, but I hoped there’d be some breaks later in the day so I could make some observations from home. 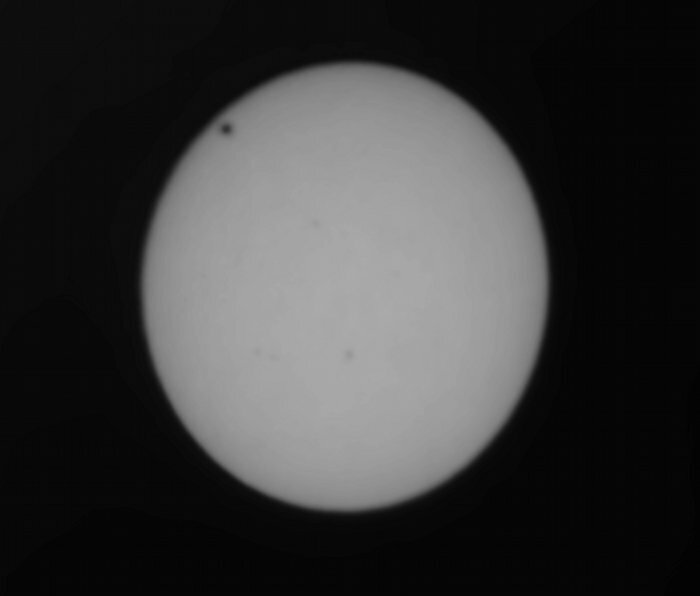 I hadn’t intended to try observing the transit at home, but after seeing it at the Planetarium, I was ready to give it a go. I took a simple approach: I strapped my binoculars to a tripod, pointed the big end toward the Sun, and pointed the eyepiece toward a piece of paper set up as a makeshift projection screen. It was very rudimentary, but it worked! 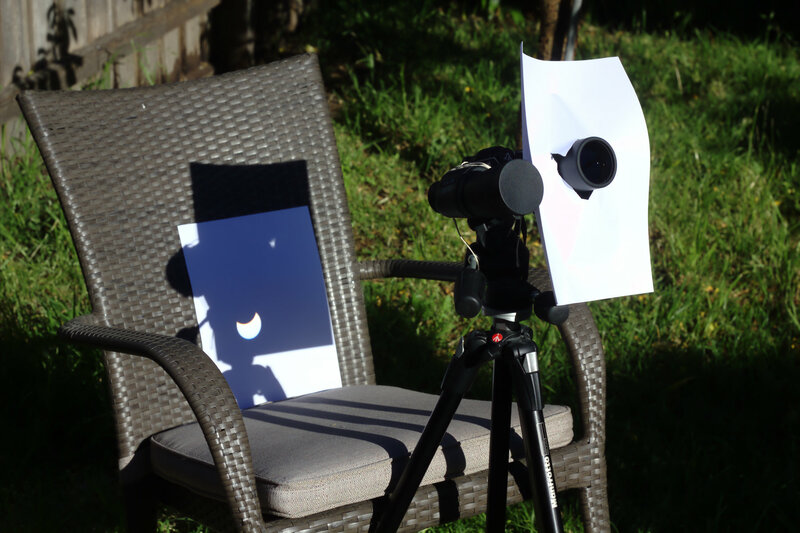 I attached some extra paper to the binoculars to act as a shade, making sure that the projection screen was in shadow to give the best possible image. I had trouble with the clouds on-and-off at home, and they rolled over after that last shot and stayed for a while; by the time they cleared, Venus was long gone. It was definitely worth the effort of setting up at home, and it was surprisingly easy to do. 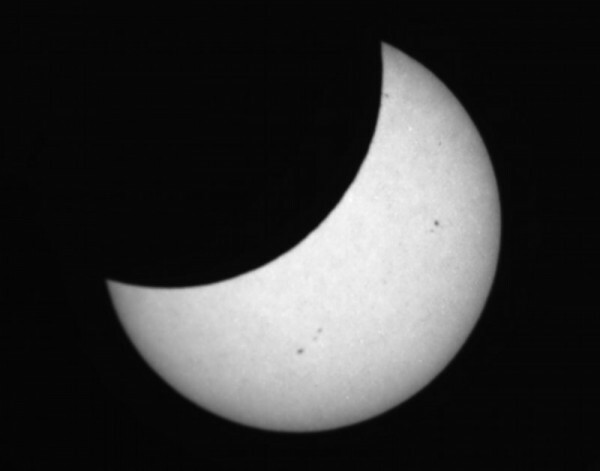 After observing this transit, I’m definitely keen to look at some other solar events — a solar eclipse would be great! I don’t know when the next solar eclipse is due, but whenever it is, I’ll be ready. Musopen is a fascinating project — it hosts public domain recordings of, and sheet music for, a large number of classical pieces. Many of the most famous classical works have long been in the public domain, but while the compositions themselves may be free to use, recordings of those works are still subject to copyright. Musopen, then, hosts recordings of those works that have also been released in to the public domain, mainly from student and college orchestras. Nearly two years ago, Musopen’s founder had an ambitious idea: use funds from a Kickstarter project to commission classical recordings from a top-quality orchestra, which would then be released in to the public domain. The campaign was a great success, and the resulting recordings are now complete. The final mixes aren’t ready yet, but I’m more excited to see that the raw multitrack recordings are available! The sessions are in ProTools format, but the recordings themselves are WAVs that can be imported in to Ardour or any other DAW quite easily. With some 560GB of high-quality orchestral stems to work with, there’s tremendous scope to incorporate these recordings in to other works, or process and edit them to create entirely new works. This is an incredible gift to the recording community, and I have a feeling we’ll be hearing elements of these recordings for decades to come. In that spirit, I spent some time over the weekend playing with one of the pieces in Ardour. I took one of the shorter (and more frantic) pieces — Mozart’s The Marriage of Figaro — and extracted a few short elements, stretching them out to create a short ambient electronic (the genre I affectionately call “artwank”) track. Beyond Ardour’s time-stretching and pitch-shifting tools, I used Argotlunar and Cumulus, which are both granular synths, to add a bit more textural variety. The last week has seen the announcement of two new LV2 synths, both from Qtractor and QJackCtl developer and all ’round good-guy Rui Nuno Capela: synthv1 and samplv1. Both are in the early stages of development, but they’re already looking very promising. You can never have enough good analogue-style soft-synths, and synthv1 is a welcome addition to the list. The basic synth design is pretty straightforward — two oscillators (with saw, pulse, sine, and noise waves), a multi-mode filter with its own envelope, and an LFO with various routing options. However, each patch actually has two instances of this synth engine, which are mixed and then processed through an effects section. This layered design is particularly handy for adding sub-octaves to create strong bass sounds, or adding some high-end sizzle to pads, especially when combined with the filter’s high-pass mode and the LFO’s panning control. It can also create very wide stereo sounds, by building subtly different sounds on each layer and then panning the layers in opposite directions. There are some other unique touches, too. For instance, the saw wave is actually continually variable between saw and triangle modes, which gives you more basic oscillator timbres to work with; hopefully later versions will allow the LFO to be routed to this wave shape control, both for saw/triangle variation and for pulse width variation. Also, the LFO has its own envelope, which can be used to adding vibrato or filter cutoff variation to a sound after the initial attack, for instance. 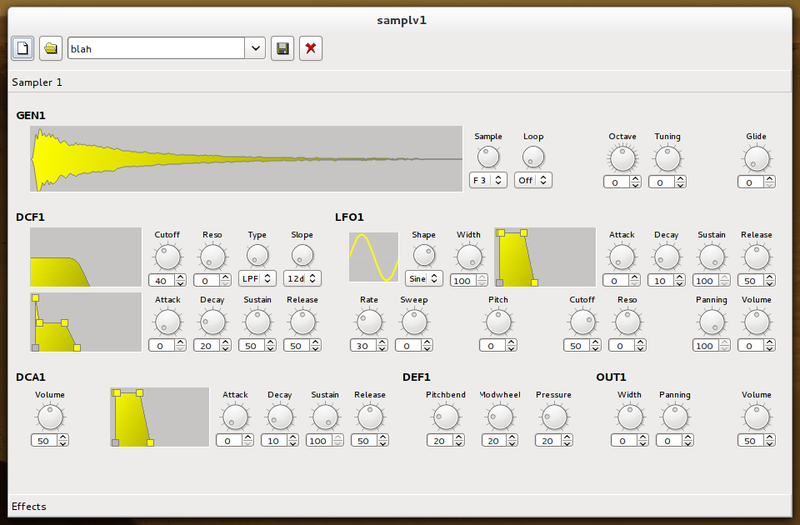 samplv1 is the more interesting for me, though, because it fills what I feel is a major gap in Linux audio: a simple plugin sampler. 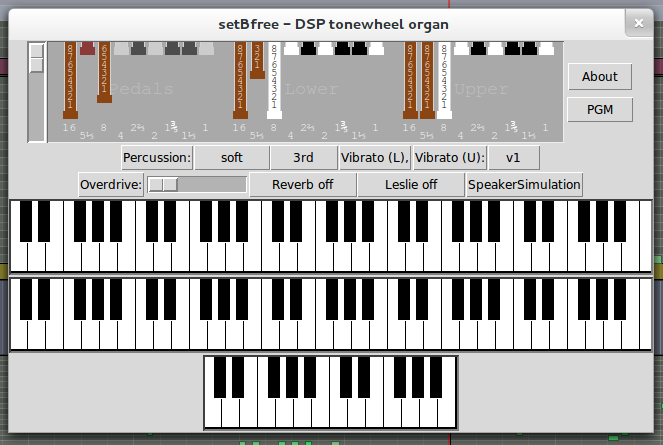 LinuxSampler is great, and it’s available as a plugin, but sometimes you just want to take a single sample and do something creative with it, especially when making percussion parts, and LinuxSampler doesn’t make that easy. Specimen (for which I recorded a video tutorial) is a better option for this, but as a standalone JACK app, it’s cumbersome to use, especially if you’re using multiple instances to host multiple sounds. In a lot of ways, samplv1 is like a plugin version of Specimen — it lets you load a sample and map it to your keyboard within seconds, and then optionally use other synth components to process that sound. samplv1 uses the same envelope-controlled multi-mode filter and LFO as synthv1, which gives you a lot of scope for creative sound design; Specimen has a bit more modulation flexibility, but it’s not as immediately accessible as samplv1 is. samplev1 also shares synthv1’s stereo effects section. It’s still early days for both of these, so don’t be too surprised if you run in to problems (I’ve had a few crashes with Ardour 3, for instance, but I haven’t narrowed down their cause yet), but they’re definitely worth checking out! Things have been decidedly quiet here after the flurry of activity across March and April, but thankfully, in the real world, things haven’t been quite so quiet. I’ve been working on a new project with a couple of really talented guys, and while I can’t say too much about it yet, I can at least reveal that it’s a game! Unsurprisingly, I’m taking care of the audio. I was initially brought on to write some music, but as we discussed the game’s design and setting, it became clear that the soundtrack would be much more sparse and ambient than my usual video game ditties. I do have a lot of ideas for the music that will fit the mood of the game, but for now, I’m focusing on the sound effects. Designing those sound effects has definitely been a challenge. I’ve been creating sounds from scratch on the Blofeld, and using Ardour and Audacity to process recorded sounds from my Zoom H1 recorder, and while those tools are all quite familiar, these sounds are unlike anything I’ve created before. Part of the challenge is just getting an understanding of what sounds I need to make, so I’ve been playing a few different games and even watching bits of movies to get ideas on what different things should sound like. A new prototype of the game should be ready soon; hopefully then I can real a bit more about what the game is and who I’ve been working with!